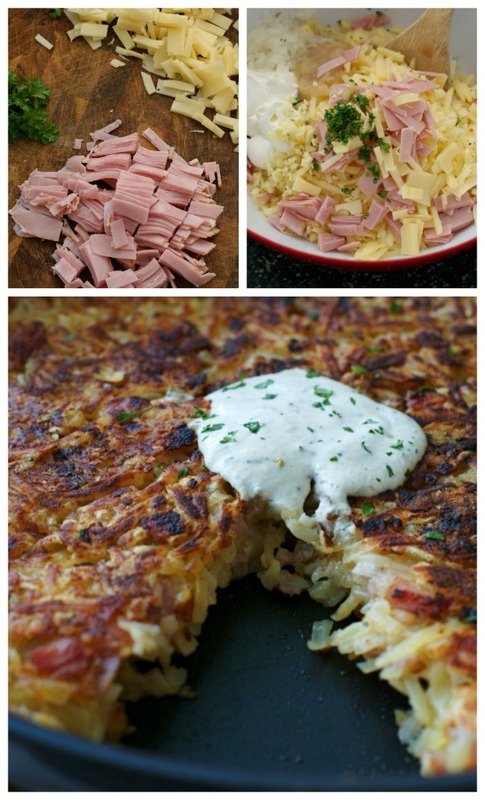 Crispy on the outside and tender on the inside, these Ham and Swiss Hash Browns with Rosemary-Apple Yogurt boast lots of thin-sliced ham, melted swiss cheese, and a dollup of creamy rosemary, apple, and mustard seasoned yogurt. One of my favorite memories from when I was a kid is big family breakfasts on the weekends. I distinctly remember the intoxicating smells of bacon wafting through the house as my dad fried it up on the electric griddle while my mom whipped up bagels, eggs, and fried potatoes. It's mornings like those that helped to shape my love for breakfast potatoes. Yep, those mornings with my sisters and parents were all about the potatoes for me. My mom would make the most delicious, golden, crisp fried potatoes with breakfast. I think those fried potatoes are the root of my current potato obsession! She always made them the same, more like home fries than hash browns, cut into little cubes and fried in a heavy skillet. They were so good! Now that I am making weekend breakfasts for my own family, I like to mix things up sometimes and make variations on mom's potatoes. 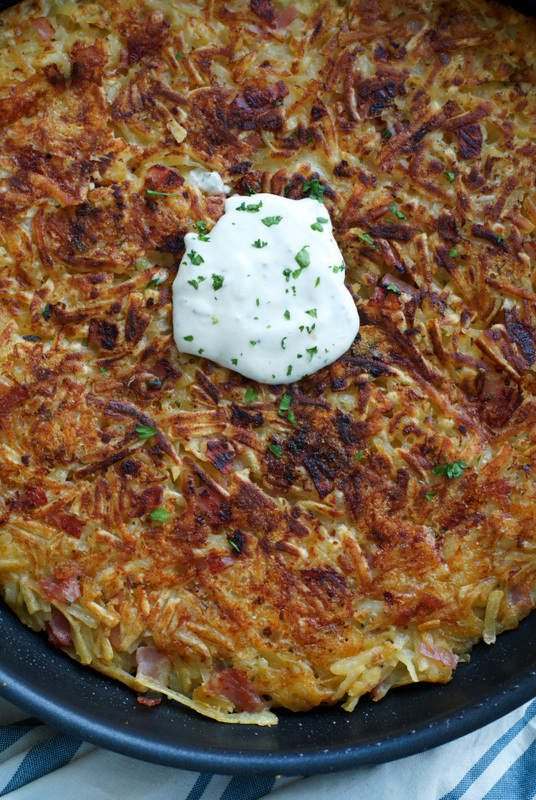 I'll make them the classic way mom did, but sometimes I'll go with shredded potatoes. 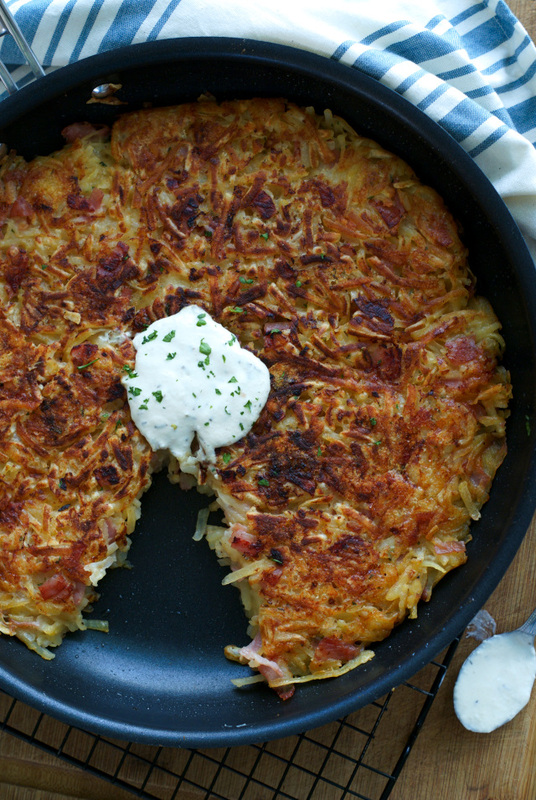 This recipe uses thawed frozen hash browns as an alternative to shredding your own potatoes. It saves time and they fry up nice and crispy, just the way I like them! Now, mom didn't usually add anything to her potatoes, but I like to get a little fancy sometimes and mix in whatever needs to be used up in the fridge. Ham and cheese were up this time around! I also mixed in some applesauce and greek yogurt to keep the potatoes nice and moist on the inside. These loaded potatoes are finished with a little bit of greek yogurt that is sweetened with apple sauce and has just a touch of mustard and rosemary mixed in. 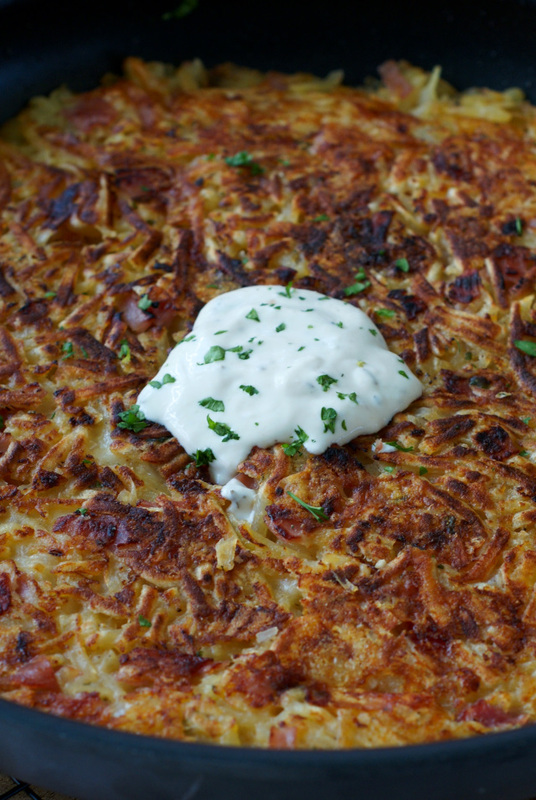 The cool, seasoned yogurt compliments the crisp hash browns perfectly and makes them just a little fancy schmancy. Weekend breakfasts with the family deserve a little fancy schmancy if you ask me. I'm pretty sure I may be the only one in my family that has an obsession with breakfast potatoes, and that's okay. I still make them even though my husband and kids only eat a few bites. The kid in me still thinks weekend breakfasts are all about the potatoes, but when my children beg for our family breakfasts on the weekends, I know that those meals are really all about the smiles and laughs we share around the table as a family. I'm so glad for those mornings growing up and I'm so happy to be able to share the same kinds of moments with my kids! In a small bowl, combine all of the ingredients for the Rosemary-Apple Yogurt. Refrigerate until ready to serve. In a large bowl, mix together the potatoes, ham, cheese, greek yogurt, applesauce. onion, garlic, parsley, and paprika. Season with salt and pepper, taste. Heat the oil in a large (12-inch) non-stick skillet oven medium-high heat. Add the potato mixture to the hot oil and spread into an even layer. Cook for 6 minutes. Flip potatoes, reduce the heat to medium, and continue cooking for an additional 5 minutes, until golden brown. Serve with the Rosemary-Apple Yogurt. I used ham and cheese sliced from the deli, but leftover ham and shredded swiss would work just as good! 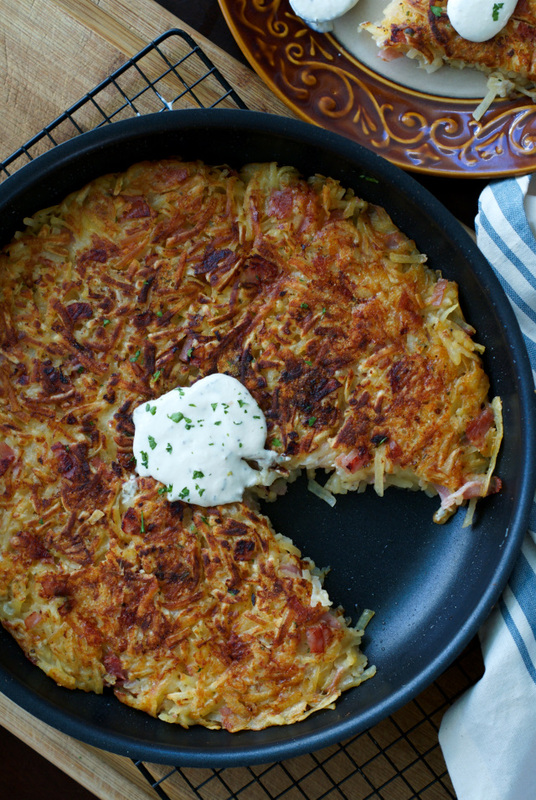 Flipping tips: If you don't care if the whole pan is flipped at once, the easiest way to get it done is to cut the hash browns into quarters and flip in pieces. I like to be a little dangerous, so I get a big ole plate, put it on top of the pan, invert the hash browns onto the plate, then slide them back into the pan. A little more tricky, but it makes for a lovely presentation when it's one big piece! I will help you eat breakfast potatoes anytime! !